A classic early American flair, with modern touches that you'll love, our Sunbury Chest of Drawers offers plenty of good looks and storage, when incorporated into your bedroom suite. From top to bottom, this beautiful chest exhibits all of the qualities we love about antique furniture. From the crisp, clean lines of the flush mounted drawer fronts, to the large solid top accented with beautiful molding and down to the classic bun feet design, this chest is sure to have the perfect balance of modern luxury and antique feel. 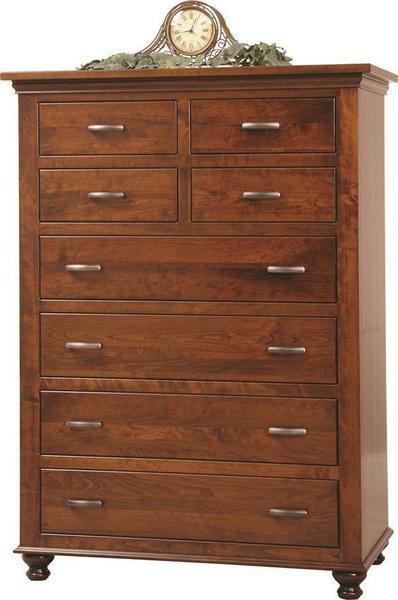 Complete with four large drawers and four half drawers, this eight drawer chest offers plenty of options when it comes to expanding your storage suite. Each drawer box is dovetailed and mounted with beautiful full-extension slides, giving you complete access to all of your items stored inside. Customize this piece with an array of hardwood, stain, and hardware combinations to choose from - giving you complete control over the final look, allowing you to incorporate this beautiful chest into any room you choose. If you're unsure of the perfect combination, please call one of our Furniture Specialists today to request stain samples, answer all of your questions, and help you start your order by phone. Toll-Free (866) 272-6773.